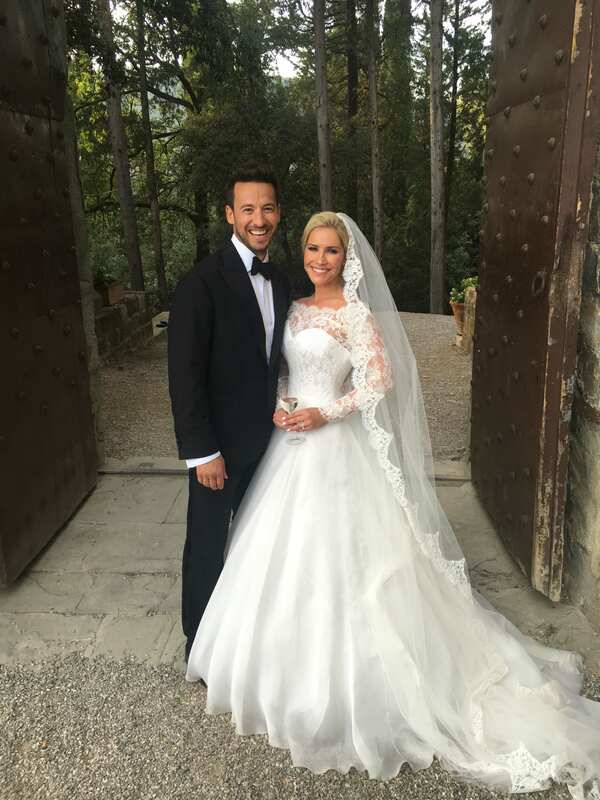 Heidi Range married the man of her dreams Alex Partakis in a breathtakingly beautiful ceremony in Florence, wearing bespoke Suzanne Neville. Heidi kindly shared these exclusive stunning personal photographs with us for you to see, and wrote about her big day on blog tbseen (text as seen below). We spent the best part of a year planning our wedding, living in that excited, loved up bubble full of ideas, hopes, dreams and anticipation for what, I’m delighted to report, was the best day of our lives! It was all we had dreamed of and more – our fairytale – and we have those wonderful memories to cherish for the rest of our lives. We’ve been married for almost six months now and you soon realise that the adventures have only just begun. Me and my best mate, a little team, our family, Mr and Mrs Partakis and Bettie our furry daughter. We arrived in Florence and the groom and bridal party were booked into the same hotel – a short drive from the wedding venue, a beautiful Tuscan castle – while I was checked into another just up the hill. We organised cocktails and canapés on the terrace of their hotel to watch the sunset and welcome everyone, followed by dinner at one of our favourite restaurants in the city centre. It was the perfect spot, in the heart of a big square where you get to see different weddings coming and going, while sitting outside enjoying a bowl of pasta and sipping on an Aperol spritz! This intimate dinner was the perfect opportunity to get some quality time with our bridesmaids, manmaids, best men and ushers before the madness of the big day. Post-dinner we went on to join a bigger group of friends, including tbseen’s Tamzin Outhwaite and Kate Thornton. As we arrived in the square they all stood up cheering and that’s when the party began – and I shed the first of many happy tears! I’d given myself a midnight curfew and was whisked back to my hotel on time by my man-maid, Jerry. After waking up first thing with all the excitement of a seven-year-old on Christmas morning, I ordered a coffee and sat alone on my balcony watching the sun come up and gathering my thoughts. There was a part of our ceremony that involved putting letters we’d written to each other in a wooden box with a bottle of wine and sealing it. The intention is that you open it in years to come to celebrate a landmark anniversary, but you promise that if your marriage ever hits hard times, you’ll share the wine together and read each other’s letters before you make any big decisions. This was the perfect time for me to write my letter to Alex, to put down on paper all that I feel for him and hope for our future. I also took the time to open the card and gift that Alex had left for me – stunning diamond and sapphire earrings to wear on the day, my something blue. A beautiful gift which also allowed me to remove the baby blue nail varnish from my little toe that I’d painted on in a panic that morning when I realised I didn’t have anything blue! I was delighted to have the fabulous Karin Darnell and Ross Williams (my other man-maid) doing my hair and makeup. They did my hair and make-up throughout my years in the Sugababes and it was so special to share that moment with them after the countless conversations through the years about how I wanted to look on my wedding day. Have I mentioned that I’ve been planning my wedding since I was seven years old? Once the bridal party joined us, we popped open some bubbles and changed into our personalized Bridal robes for some getting ready photos! Thanks to Suzanne Neville, who designed my dress, I really did feel like a princess for the day. From the moment I saw my dress I knew it was ‘The One’ as soon as I put it on. I’ve always known I wanted lace and long sleeves. I was looking for something beautiful and classic and my dress exceeded all my expectations. I loved my veil too. In fact I loved it so much that even in the 34 degree heat I kept it on through dinner, right up until the disco in the evening! I can remember every detail of our day… Stepping through the arched gates, Alex’s father escorting me down the aisle with a string quartet playing Canone Di Pachabel, trying to take deep breaths/walk slowly/not trip up/not cry and ruin Karin’s eye makeup, my family and friends smiling back at me, my heart exploding with love and then there he was – my husband! We got married under a floral arch of white hydrangeas and roses on the terrace of Castello Di Vincigliata, high up in the Tuscan hills looking back over Florence. The sun was shining – my new hubby said he felt as though his foot was cooking in his shoes! – and we were surrounded by our nearest and dearest. It was a day filled with so much love, happy tears, laughter and fun. There was even a rainbow over the castle in the shape of a smile and I’m certain it was my beloved Nanny V letting us know she was watching us from heaven. Don’t miss the second part of Heidi’s exclusive wedding blog!